Before Lindsay Lohan’s Beach Club even debuted, it was billed as a “Vanderpump Rules-style show” show set in Greece. That comparison was a major draw for viewers. Oh, and a curiosity about Lindsay Lohan’s life these days. Vanderpump Rules is a consistently entertaining reality show. The comparison is not a bad thing. However, the Lindsay Lohan’s Beach Club cast feels very differently about that. They had a lot to say about the Vanderpump Rules cast members, specifically Jax Taylor. In an interview with Page Six, multiple Lindsay Lohan’s Beach Club cast members chimed in about the comparisons. Billy Estevez declared, “They should be so lucky!” Really? They’re on Season 7 of a highly successful show and we don’t even know if Lindsay Lohan’s Beach Club will make it to Season 2. Mike Mulderig scoffed, “We’re the ones being called a cheap version of them?” Then, Brent Marks, the most disliked polarizing cast member chimed in with his two cents. Brent declared, “They work at a little, cheap restaurant in West Hollywood.” Since when is SUR a “little, cheap restaurant”? Tell that to Lisa Vanderpump, Brent. Then Mike swooped in with another dig at the Vanderpump Rules cast: “We don’t microwave our food.” And they probably don’t either. They’re probably eating for free at SUR and ordering Postmates. They’ve been on Vanderpump Rules for SEVEN seasons. They (should) have some funds at their disposal. Maybe Mike just stopped watching after the first two seasons? There were definitely some microwavable meals back in the day. Brent remarked, “It was a good thing that they got rid of Jax.” That never happened. It will never happen. Jax might get fired from “working” at SUR, but he will always be on this show. Does Brent even watch this show? He followed up with, “Jax needed to go.” But he never actually left. Then, Billy came through with a mic drop moment. He told Brent, “You are the Jax of the group!” The joke did not land (with Brent). In response, Brent predicted, “I’m probably gonna be your boss next year, so it’s cool!” Fat chance, Brent. The entire cast rejoiced when Sarah Tariq poured a bottle of tequila over his head during the last episode. Let’s be honest, the Vanderpump Rules comparisons are driving people to watch Lindsay Lohan’s Beach Club. The guys should be grateful for the attention. Then again, these comments did get them just that: attention. And newsflash: people can watch more than one reality TV show. They’re not even on the same night of the week. TELL US- WHAT DO YOU THINK ABOUT BRENT, MIKE, AND BILLY’S COMMENTS? 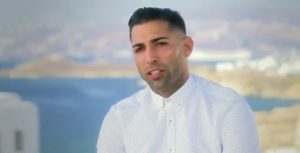 IS BRENT THE JAX TAYLOR OF LINDSAY LOHAN’S BEACH CLUB?